I'll admit, I wasn't actually intending to read Alice's Adventures in Wonderland when I first picked up my edition. Having tried and failed to read it when I was younger, I wasn't all that interested in the actual novel itself. 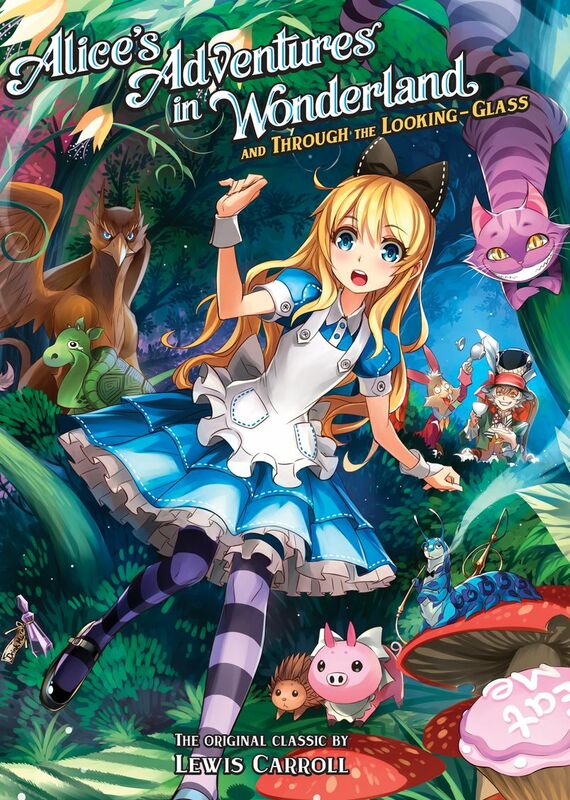 But, as you can see from the below cover, this looked like it would be a manga adaptation, which I was interested in purely because I like that whole Wonderland aesthetic. When I got it home and out of the shrink-wrap, however, I found that rather than an adaptation, I had picked up an illustrated version of the original novels, which was a tad confusing considering it was a comic shop. Either way, it seemed a shame to waste a perfectly nice edition of a book, especially when the art looked so pretty. The reader follows Alice, a young girl who finds herself in another world after following a white rabbit dressed in a waistcoat down a rabbit hole. There she meets a series of strange characters and must navigate an assortment of situations in which logic appears to have disappeared entirely. I went into Alice's Adventures in Wonderland and Through the Looking-Glass expecting to absolutely hate it. As I mentioned above, I couldn't get into it when I was younger, so I wasn't really expecting a huge deal. As it was, I was pleasantly surprised to find it thoroughly average. In a weird way, I think it is both too universally well-known and also too hopelessly old-fashioned to really speak to people in the way that they expect it will. Firstly, the too well-known part. There isn't much of either book that the general public isn't familiar with in some fashion. Off the top of my head, the only parts that were unfamiliar to me were the Duchess' pig-baby and the giant puppy from Adventures in Wonderland and the battle between the lion and the unicorn from Through the Looking-Glass. As for the rest of it, it's all pretty familiar. Even some of the more minor parts have become part of everyday pop culture. "What's the difference between a raven and a writing desk?" has been so over-analysed that the riddle has gone from having no answer to too many. Hell, I remember being told "Time for bed the Walrus said" when it was getting too late, which is unintentionally sinister now that I think about it. It's so ubiquitous now that public consciousness of the property is probably influenced as much by modern reinterpretations as it is by the original. This mention of modern reinterpretations leads me to my second point, which is the hopelessly old-fashioned part. You can kind of tell from some of the poetry that Carroll is playing on rhymes of the time, but it's hard to appreciate the cleverness of it when the original rhymes aren't well-known anymore. Without that context, the book has to rely on its plot, and if you have any concept of Alice's Adventures in Wonderland then you can already tell what the problem with that statement is. Without the contemporary context, the book is left to rely on events that only barely have continuity with one another and don't have any stakes to speak of. It feels like a story that a child would make up and honestly it just strikes me as bizarre that it would last so long in cultural memory.